Plasma Etching and deposition Options: PECVD ICPECVD Atomic Layer Deposition modules can be combined with up to two cassette stations for high throughput processing of up to 200 mm wafers. Three to six port transfer chambers are available for clustering ICP plasma etchers, RIE etchers, atomic layer deposition systems, PECVD and ICPECVD deposition tools to meet the requirements of R & D. Samples can be loaded via vacuum loadlock and / or vacuum cassette station. 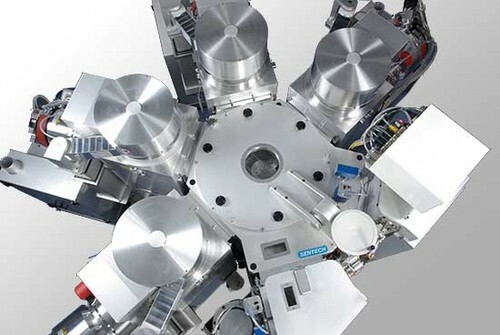 SENTECH cluster tools comprise plasma etching and / or deposition modules, transfer chamber, and vacuum loadlock or cassette station. Transfer chambers including handling robot are available with three to six ports. Up to two cassette stations can be used to increase the throughput. The transfer chambers can be equipped with multiple options Options: ICP / RIE etcher modules ICPECVD / PECVD deposition modules Vacuum loadlock Vacuum cassette station High vacuum pumping unit . SENTECH cluster tools for R & D are operated by one graphical user interface, the SENTECH control software . Powerful control software is available for industrial high throughput cluster tools. ICP-RIE plasma etching modules can be combined with two cassette stations for high throughput parallel processing of 200 mm wafers. Modules of ICP-RIE, RIE, PECVD, and ICPECVD can be combined with vacuum loadlock and / or cassette station to fulfill the special requirements of R & D.